“People look at stars, but the stars are not the same for everybody. For people who travel, the stars are guides. For other people the stars are nothing, only small lights in the sky. For scientists, they are problems. For my businessman, the stars are important because they make him rich. But all these stars are quiet stars. For you, it is different. You have stars like nobody else. When you look at the sky at night, there is one star where I live. And because I laugh on one of these stars, you can feel that all stars are laughing. You have stars which laugh.” And he laughs again. 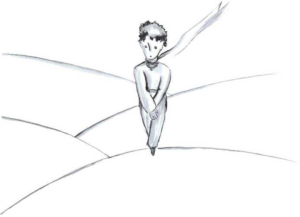 “When I leave,” the little prince continues, “you can be sad. But believe me, time can help you be less sad. Then you can be happy that you know me. You can always be my friend. You can always laugh with me. “And for you the stars can be like little bells which laugh.” And he laughs again. “I don’t want to leave you,” I say. Then the comes. I don’t see the little prince leave. I don’t hear him when he goes away from me. When I catch him, he is walking fast. He only says to me, “Ah! You are here.” And he takes my hand. But he is not happy. And he is quiet too because he is crying.